PDF of the entire issue (5.53 Mb). The leaders of TWAS discuss how the academy can advance further. Robotics is revolutionizing farming. Data in Africa must focus on girls. The spirit of cooperation prevails at the 27th TWAS General Meeting. Rwandan President Paul Kagame says science can narrow the North-South gap. TWAS President Bai Chunli says Rwanda has prospered by investing in science. Two decades after genocide, the country is emerging as an African science leader. 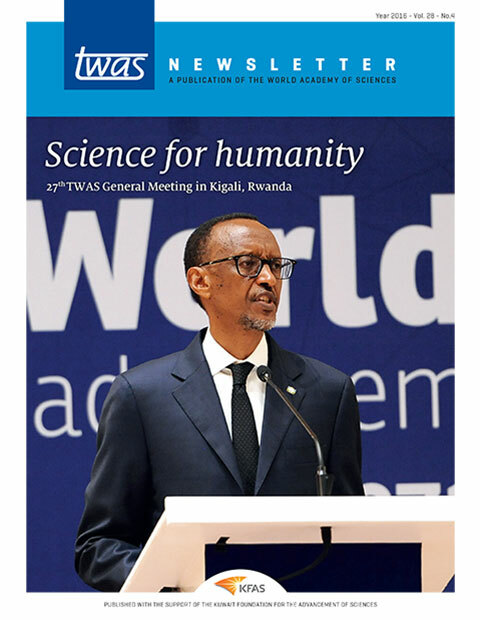 Accelerating the development of Rwandan science. A TWAS Medal lecturer describes the rebirth of Rwandan science. Science ministers see education, partnerships as crucial. The Chinese scientist developed nano-sized materials useful for clean water, medicine and energy. Marian Nkansah’s heavy-metals research won her the first-ever Al-Kharafi Prize. Bijay Singh is a pioneer in biomaterials that could be used to deliver drugs. M.N. Hounkonnou was honoured for high-level maths research. Former TWAS President C.N.R. Rao spoke passionately on his chosen field. The TWAS Young Affiliates Network will give early-career scientists a platform. Ghanaian scientist Julius Hagan studies local chickens to find adaptable breeds. Olaniyi Fawole, South Africa, studies pomegranate chemistry. Leaders called for broad cooperation for shared development.